All but one regular automatic berth from a regular season champion has been decided, as Kentucky looks to nail down the outright SEC title, but that doesn’t mean there aren’t plenty of key matchups remaining as teams vie for NCAA Tournament seedings and berths. Here’s a look at our top five picks for must see Week 14 matchups. The two second place teams in the SEC face off in Knoxville, while league leader Kentucky faces off with South Carolina with the outright title on the line. Should the Wildcats stumble, the victor of this match still has hope for a shared title. 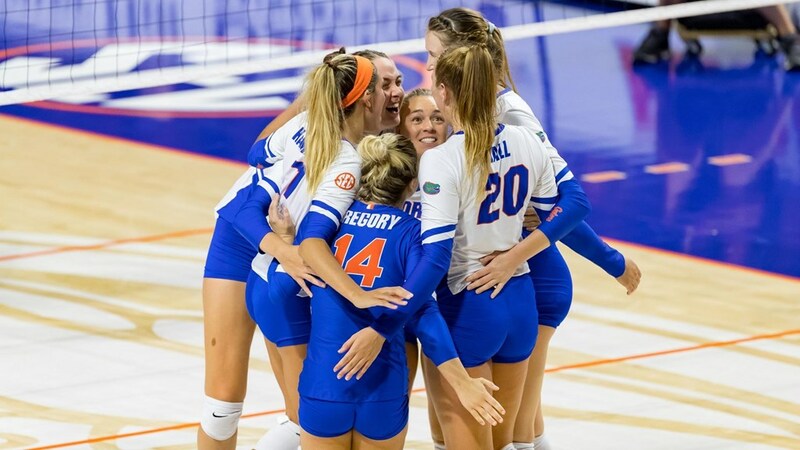 The Gators are on a four-match win streak heading into their final road contest. Florida faces South Carolina in the regular season finale on Friday. The Vols have won nine in a row including four set wins over Missouri and Arkansas. Florida leads the all time series 50-13-1 and has won the last eight meetings with Tennessee. Tennessee won the last match when both teams were ranked in 2011 when the Lady Vols defeated the Gators in four sets inside of Thompson-Boling Arena. Oregon is one match back from second place USC (12-6) heading into the final week of the regular season, while Washington is two matches back in fourth place (10-8). Oregon is coming off a five-set loss to Colorado on Friday, while Washington dropped its last match via sweep against No. 2 Stanford. Washington leads the all-time series with the Ducks 67-23 and has won the last two meetings. Minnesota has already claimed the outright Big Ten title but will look to become the first team to go 20-0 in Big Ten action since Penn State did so in the 2009 title run. Minnesota will look to run the table in the Big Ten with its final ranked battle of the regular season. The Golden Gophers face Rutgers in the season finale on Saturday, but that contest with the 0-18 Scarlet Knights should be smooth sailing for the conference champs. Penn State is looking to stay in the race for second place in the Big Ten (13-5). The Nittany Lions are currently tied with Nebraska and Wisconsin for third behind Minnesota and Illinois (15-3). The Nittany Lions lead the all-time series 47-11, but Minnesota topped PSU via sweep in the Big Ten opener on Sept. 19 in Minneapolis. A top four seed in the NCAA Tournament could be on the line for the Fighting Illini heading into the regular season finale. Purdue also could be still in the running to host NCAA first and second rounds. Illinois is No. 4 in the RPI, while the Boilermakers are No. 16. Illinois is on an 11-match win streak heading into its Wednesday contest at Michigan State, including wins over Michigan, Nebraska and Penn State. Purdue bounced back from a three-match losing streak with a five-set Senior Night win over Iowa on Saturday. The Boilermakers take on Indiana in Bloomington on Wednesday before heading to Champaign on Saturday. Illinois leads the all-time series 46-41, including a 3-1 win in the teams’ Big Ten opener in West Lafayette on Sept. 21. The title match of the MVC Tournament could bring a rematch of the top two seeds – No. 1 UNI (22-9, 16-2) and No. 2 Illinois State (24-6, 16-2) – although upsets are a possibility. The teams shared the regular season title at 16-2. Both teams likely have secured a spot in the NCAA field, checking in at 22 and 31 respectively in the RPI. If it comes down to the Panthers and Redbirds, the teams split the regular season meetings. UNI swept Illinois State in Cedar Falls on Oct. 5, while the Redbirds won the rematch 3-2 on Nov. 3. Illinois State is looking for its first MVC Tournament title since 2014, when the team defeated UNI 3-1. The Panthers last won the MVC Tourney title in 2011, although the team made the final in 2014 and 2017. Wendy Mayer has worked in athletics media relations for the last 20 years. The Northwest Missouri State alumna is currently senior writer for Volleymob.com after spending the last 15 years with Purdue athletics.